After the heavy rain last week the river rose steadily peaking on Saturday. Since then it has dropped in slowly and we are almost back to summer height. As the Varzuga drops so we are adjusting our tactics to suit the changing conditions. On Sunday there was just a sufficient weight of water to suggest that an intermediate tip and larger fly would be best, by yesterday afternoon our guests were using longer leaders and smaller flies on floating lines. ﻿﻿Last night after dinner we experimented in Party Pool, fishing small copper tubes very slowly through the draw at the end of the pool. James F and James D were well rewarded with four good salmon all of which took the fly so softly we thought they were parr or grayling until the line fully tightened and they exploded into a strong fight. 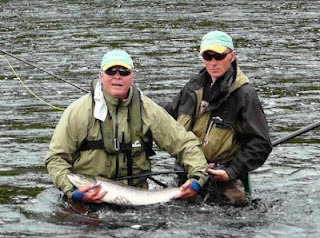 At Middle Camp we landed 42 fish, David S had his best ever day with nine to his credit. Jamie G who had never caught a salmon until 24 hours ago proved that his first two were not just luck, he is really getting the hang of it and put three in the book yesterday. 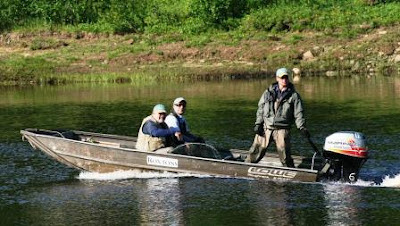 At Pana they are still able to boat down as far as Ponzoi, they landed 60 to the eight rods with the salmon well spread out through all the beats. Our Spanish guests at Kitza had a cracking day catching 49 salmon with Emillio RG landing 13 for his best ever day the day. It remains calm and overcast and to the South we can just see banks of sea mist over the White Sea coast, quite good fishing conditions. With the water now lower we are back into our Summer routine and 2 pairs of rods, Anthony, James F, David S and John have gone up Yovas rapids for the whole day where Anton and Sergei will barbeque a fresh salmon for lunch.